How Great is Srila Prabhupada? If we enter the ocean by boat we can navigate our direction to a destination based on the stars. The stars are compared to so much knowledge found in the Vedas. One of those stars in the sky is called Dhruva-loka. In modern science Dhruva-loka is called the Pole Star or North Star. When we are in the ocean if we lose sight of that star, if we cannot see that star then we cannot benefit from all the other stars. We will be lost in the ocean. The Pole Star doesn't move. It is fixed in one place. As long as we can see the Pole Star, which never moves, than we can determine so many things by the other stars which are moving. But if we do not have a fixed bearing with the Pole Star then we are lost. Sri Guru may be compared to the Pole Star because with the help of the guru we can derive great benefit from the Vedic knowledge. But without the help of the guru we will be bewildered in our attempt to understand the Vedic knowledge. The Vedic knowledge is sometimes compared to a 'jungle of knowledge'. Not just an ordinary jungle but a very dense jungle. In this material world we are already in the jungle of material misconceptions. If we want to search for God then we must come out of misconception. To fulfill our search we may enter into the study of the Vedas. But if we study the Vedas without the help of the guru we may eventually come to conclude that there is no God. Or we may conclude that there are many Gods. Or worst of worst we may conclude that, "I am God. We are all God". In this way, without the help of the guru, we may become bewildered and meet with ultimate ruin. In the Vedic literature there are various opinions. In the Visnu Purana it says that Visnu is Supreme. In the Siva Purana it says Siva is the Supreme. In the Markandeya Purana it says that Durga is Supreme. And in the Upanisads it is mentioned 'aham brahmasmi' - 'I am Brahman'. So one may think that there are many Gods, or that there are so many Gods that there is no God at all. We may think that what the Vedas say cannot be true because there are too many apparent contradictions. Or we may take 'aham brahmasmi' as the ultimate conclusion and then conclude that we are all God. This is what happens to persons who study the Vedas without the help of the bona-fide guru. Srila Vyasadeva compiled the Vedas in four divisions, Atharva Veda, Sama Veda, Rg Veda, Yajur Veda. Then he compiled the Puranas and other literatures. Lastly he wrote Vedanta-sutra. Vedanta means the end of knowledge. After revealing so much knowledge Vyasadeva tried to bring his writing to an end, to the conclusion of knowledge. After he completed Vedanta-sutra however Vyasa still did not feel satisfied. He was not satisfied within himself. His mind was troubled. He crossed the ocean of knowledge but still he was not satisfied. Then the guru of Vyasadeva, Narada Muni, came and Vyasadeva inquired from his guru why he did not feel satisfied. Vyasadeva asked his guru why even after completing all the departments of knowledge he was not satisfied? Then Narada Muni said, "Actually you are a cheater. You have cheated the people of the world and you have done a very wrong thing. You have only indirectly described the truth in so many divisions and so many facets and even when bringing it to an end you are simply misleading the people." Then Narada instructed Vyasa, "Without directly coming to describe the lila of Krsna, the Supreme Personality of Godhead you have not done justice to truth. Now you have to give the meaning of all these things in one book." Then Vyasadeva wrote the Bhagavata Purana, Srimad Bhagavatam. 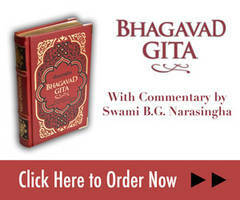 Bhagavatam is the natural commentary on Vedanta-sutra. The message of the Bhagavatam is summarized in the beginning, krsnas tu bhagavan svayam. So that is the meaning. Of all the Devas, of all the incarnations of the Supreme Lord, Krsna is the Supreme and original. Vyasadeva revealed in Bhagavatam that Krsna is the asraya-tattva. In other Vedic literatures Vyasadeva only revealed the asraya-tattva in part, not in full. If you are a ghost then Siva, who is known as Bhutanatha, is your asraya (shelter). Siva stays in the cremation grounds and he gives shelter to so many ghosts. In Kailasa also many ghosts are given shelter. If you are a materialist then Durga is your asraya. If we are a materialist then we get everything from this material nature by the grace of Durga. But when we are ready for the perfection of life, Vyasadeva revealed, "Narayana is the asraya-tattva, because Narayana resides in Vaikuntha, which is above this material world". But in Srimad Bhagavatam Vyasa revealed that the highest plane is called Goloka. Because Vaikuntha is above all the material world everything is under the shelter of Vaikuntha. Because Narayana is the Supreme Lord in Vaikuntha everything is under His shelter. Then Vyasa revealed, "If we journey to the highest place in Vaikuntha and look towards the spiritual sky, from there we will see a land known as Goloka Vrndavana." Goloka Vrndavana is above Vaikuntha and in that place Krsna is the Supreme, Sri Sri Radha-Krsna are Supreme (Krsna is the visaya [enjoyer] and Radha is the asraya [shelter]. Above Vaikuntha is Goloka Vrndavana and Krsna resides eternally in Goloka Vrndavana, giving shelter to all His devotees. Vyasadeva therefore described that the lotus feet of Krsna are the Supreme shelter of all living beings. Krsna confirmed this also - jiva bhuta sanatana. Krsna said in Bhagavad-gita that all these jiva's have come from Him. All living beings are His parts and parcels. He is their ultimate shelter. So the dearmost representative of Krsna comes to the world to represent this message of Vyasadeva -Krsna is the Supreme Personality of Godhead. There have been many gurus in the world since the time of Vyasadeva, but all of them did not represent the ultimate conclusion of Vyasadeva. Someone may ask, "Is there any thing special about your Prabhupada, your Guru?" Naturally we will say, "Oh of course, about my guru there are many special things". Even if our guru never left the village in which he was born, still we will think that our guru has many special qualities. And if we are asked we will say, "My guru saved me from the ocean of ignorance. That is the special quality that makes our guru different from all others and especially dear to us." Without guru our eyes are sealed in darkness. We are born into darkness, into ignorance, but our guru opens our eyes with the torch light of knowledge. This common point we will find between all bona fide gurus and bona fide disciples. But about our Guru Maharaja, Srila A.C. Bhaktivedanta Swami Prabhupada, we must say that there is a special characteristic found in him that is very rare and to this day we have not seen that it has been duplicated. And what is that? It is that previously what was only known in India and only in the most cultured spiritual sections of society -that thing which was only known there, he took that out of India to every town and village in the whole world. This is the prediction of Sri Caitanya Mahaprabhu, that the Holy Name of Krsna will be spread in every town and village of the world. By the mercy and instruction of Srila Prabhupada, the Holy Name of Krsna was spread all over the world. From far away places in the North such as Siberia and deep into the Southern reaches of Africa and Australia, to China in the Far East and throughout the Western world -the Holy Name of Krsna and the worship of Sri Sri Radha-Krsna was carried everywhere under the guidance of Srila Prabhupada. A guru or a great acarya may spread Krsna Consciousness in a village or even in a state or a country but to spread Krsna consciousness throughout the whole world, that indeed is very rare. For example, Ramanujacarya, a very great Vaisnava saint, spread Visnu-bhakti in Tamil Nadu, Karnataka and Andhra. When Ramanuja went to Kerala he tried to start there but they told him to leave. Ramanuja is considered to be the sakti of Ananta, still when he preached in Kerala they did not accept, they told him to go. Who can speak better than Ananta, who has a thousand mouths, and knows all the Vedas? But still Ramanuja was not successful in Kerala. There is a place called Tananur in Karnataka where Ramanuja debated with sixty thousand Jain philosophers and defeated them. At that time Ananta personally manifested through Ramanuja and defeated and converted the Jains. If we visit the Yoga Nrsimha temple in Tananur we will see one Deity of Ramanuja and behind him is Ananta. The Sthala-purana there says that on that day Lord Ananta Himself came there and with many mouths he was arguing many points with the Jain scholars and He defeated them all. So Ramanuja was indeed a very great personality, yet he could only spread his mission successfully in three states, Tamil Nadu, Karnataka and Andhra. Another very great saint in India was Madhvacarya. He is considered to have been an incarnation of Bhima and Vayu. He was a very great philosopher, very learned and highly elevated spiritually. But Madhvacarya was only able to spread his mission successfully in Karnataka. Practically speaking, outside of Karnataka nobody has heard of Madhvacarya. Of course, on occasion he preached in Varanasi, but the people of Varanasi never became the followers of Madhvacarya. Varanasi remained what it had always been, a place of Mayavadi philosophers. Both Ramanuja and Madhvacarya were indeed very great personalities, but their spiritual influence was more or less regional. However, in the time of Srila Prabhupada he not only had an influence in a few states in India but he traveled around the world twelve times and successfully spread his mission very widely. Because of his preaching work the name of Krsna and Vaisnavism is known in almost every country in the world. With this consideration we may ask, "How great is Srila Prabhupada?" When the mission of Ramanuja, who held the sakti of Ananta, was successful in only three states and the mission of Madhvacarya, who is Bhima and Vayu combined, was successful in only one state then what is the power and greatness of that person who spread Krsna Consciousness throughout the whole world? How great is Srila Prabhupada? When Ramanuja and Madhvacarya toured India for spreading their missions they had to contend with the opposing elements of Hinduism, Buddhism, Islam, the materialists, and the Mayavadi's. But when Srila Prabhupada went out into the world to spread Krsna consciousness he had to contend with all of the above and more. Especially the scientists, who hold a grip on the whole world, were a formidable opposition to Krsna consciousness, but Srila Prabhupada defeated them and many of them surrendered and became his disciples. Srila Prabhupada had to fight with many opposing elements and in countries where the culture was not at all favorable for spiritual advancement in Krsna consciousness. Yet he established over one hundred temples, asramas, and Krsna conscious communities throughout the world. With our mind we might try to imagine who he was, what power stood behind him, what is his eternal spiritual identity. Some of the greatest thinking Vaisnavas I have ever had the good fortune to meet considered that Srila Prabhupada was the sakti of Nityananda, of Baladeva. Ramanuja held the shakti of Ananta, but Ananta is an amsa of Baladeva. Amsa means a part - Baladeva is the source of Ananta. Baladeva means the spiritual potency of Godhead, the full spiritual potency and energy of Godhead. In Gaura-lila, Nityananda Prabhu and Baladeva are considered non-different. Many great transcendentalists in our times, who witnessed what our Guru Maharaja achieved, have concluded that he was the sakti of Nityananda Prabhu, a saktyavesa-avatara. That means that he was empowered with the sakti of Sri Nityananda Prabhu to spread Krsna consciousness throughout the world. Nowadays we may meet a big svami or a guru (especially in India) who has many disciples and when asked, "Who are you?" he will say, "I am Bhagavan, I am God!" or he may say "I am the Jagat-guru (the spiritual master of the universe)." But when our Guru Maharaja, Srila Prabhupada was asked "Who are you?" he would say, "I am the humble servant of my gurudeva. My only credit is that I am the obedient servant to the order of my guru. All the success that I have is due to the grace of my guru." Although it is the opinion of many great devotees that our Guru Maharaja was a saktyavesa-avatara of Nityananda Prabhu, still by his own words he considered himself to be the humble servant of his guru. Our Guru Maharaja had such a vision that he could see that the whole world could become God conscious, Krsna conscious, but still he considered himself the humble servant of his guru. If we have love for someone then we may naturally exaggerate their qualities, because that is the natural way of love. But even without any exaggeration due to our love for our Guru Maharaja if we say that Srila Prabhupada was one of the greatest saints to have ever come to this Earth, it cannot be taken as an exaggeration - his life and achievements stand as evidence for his greatness.